This cabin is named after the Wonderland Trail, a famous hiking route that circumnavigates completely around Mount Rainier. It draws hikers from around the world. This cabin is the perfect place to rest and relax after you complete the 10 day, 93 mile trek and cumulative 22,000 feet of elevation. Year round the living room is flooded with light from the high windows and in the summer you can stroll out the glass doors to spend days on the large deck which is especially soothing at twilight. On the north end of the deck is the large hot tub, sure to warm up your body and your soul. After sleeping on the cold hard ground during your Wonderland hike, you will love the large master bedroom with king sized bed, hotel quality linens, and soft fluffy pillows. In the second bedroom there is a bunk bed, but the bottom is double bed width for extra space. The third, has a private deck and two sets of bunks which means there are sleeping spots for 9 people in beds and that beats even the big tent you took on the hike. There are 2.5 bathrooms with hot showers that you'll enjoy after that hike. One bathroom has a big Jacuzzi and the other even has a steam room. No more frigid river waters trail sponge baths. These bathrooms are to die for. The kitchen has been upgraded with quality appliances, large refrigeration space and comes equipped with all the pots, pans and utensils you'll enjoy using after cooking over a camp stove. We supply all the utensils you'll need as well to enjoy your meal afterwards. The home is surrounded by large trees and the yard is left in a natural landscape as is common in this mountain area. You may see squirrels, rabbits, and the herd of elk that frequent the area. Wonderland Lodge is in a quiet mountain neighborhood, an easy stroll to the white river, a great place for children and adults to bicycle ,and also close to hikes for all levels of experience. You don't have to be a mountaineer to stay at this home, you just have to like comfort and convenience. 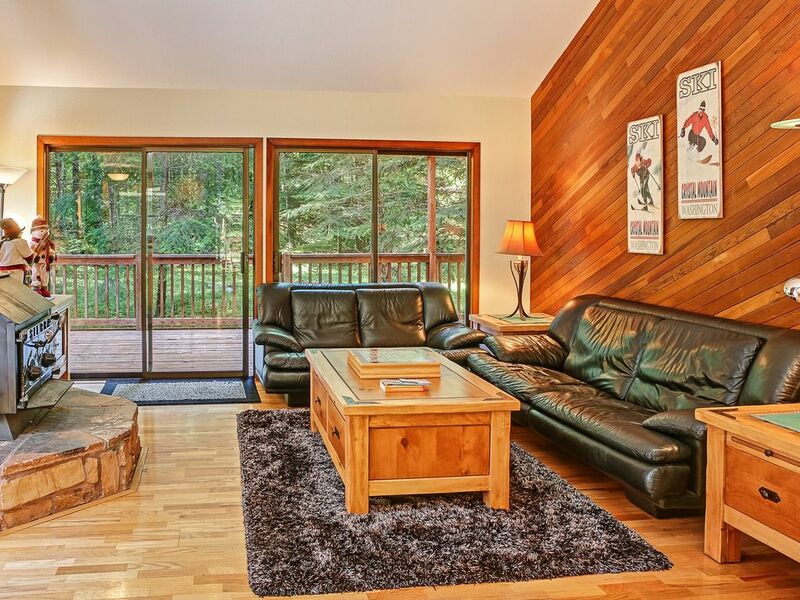 When booking any of our Greenwater, Crystal Mountain properties, you'll have the absolute BEST access to the nearby outdoor adventures that Mt. Rainier has to offer. The area has endless options for the entire family (or all of your friends) to dive into whether it be during the Winter or the Summer. Thankfully the snow covered mountains offer more than just one activity! Hit the slopes to ski or snowboard. During the Winter, some of the trails are open for hiking if you're feeling more adventurous. Visiting us during the Summer? That's perfect too! The many hiking trails that the area has to offer are sure to suit the whole family. Ranging from easy to difficult, the trails are all beneath towering old growth trees that are a sigh to see. Every so often you'll get a glimpse of that beautiful peak as well. Have a liking for waterfalls? Work your way through the trails and you'll find some of the most beautiful falls in the area. About 6 miles from all of the properties, you'll find yourself at the Northeast Entrance to Mt. Rainier. Here at Crystal Cabins we vow to make booking with us simple and exciting. We know that booking a rental property home for your vacation can be unfamiliar territory for some, while others know their way around it. Because we know this, we ensure that each of our properties are up to high quality standards. We do our absolute best to provide support to our guests when booking. This house was wonderful and met all our expectations. From the cute little snowmen to the wonderful kitchen, everything was exactly as descripted on the website. We had a great Christmas experience at Wonderland Lodge. Very spacious, well-equipped cabin. The secluded location makes for a perfect getaway. We watched deer off the back porch - a bonus. Great location and a good place to stay! 1. The microwave glass tray was missing when we arrived. We telephoned the manager and she apologized. She also told me that the previous renters had damaged it and they couldn't get a new one in time which I understood. 2. The house could use a good clean on the exterior. 3. The biggest complaint was a lack of curtains and/or blinds. I talked with the manager on this and she said that we were the first ones to bring this up. I don't mind being out with nature but when you are next to other renters, a little privacy goes a long way for everyone. If we had to change, we had to use the restroom to do so. There were blinds on some of the upstair room windows but not on the big windows upstairs or any of the windows in the living, dining, kitchen areas. Someone had placed some nails on the moulding above the master bedroom's patio window and I believe that someone used a sheet to hang up a makeshift curtain. We didn't do that because we didn't want to potentially damage the sheets. 4. The ice maker in the kitchen didn't work (possibly disabled?) but there were ice trays. Also the water filter needs to be changed on the fridge. 5. There are video game systems (1st gen Xbox and a Nintendo 64) but the Nintendo was missing the power cord. The couch by the tv is also a little run down. 6. We couldn't use the gas grill. It has quite a bit of rust on the grill and the grill grate should be replaced. That was a bummer because we wanted to have a nice barbecue. I was hoping for a little bit more but we had a good stay. I am not sure if we'd come back to this particular house but we do like the location. I would just suggest putting some money into the little things because I know that the investment will pay for itself. The cabin is very nice and is in great shape, kept well. The sleeping accommodations were great for the six that we had. The hot tub and fireplace were awesome after a day of skiing in 20 degree weather. There apparently was a wind/snow storm before our stay, and had knocked out some of the electronic devices in the house, so be aware that this is a possibility during the stormy early winter months. Even without those few things (microwave, dishwasher, clothes dryer) we were able to easily stay plenty warm and thoroughly enjoyed our stay. Jan came by halfway through our stay and dropped off more wood to keep us warm and let us know that someone was there to help if we needed anything. I would definitely stay here again. This is a great cabin with a big kitchen great for big families! The outside hot tub was amazing!